UMD swept their spring break trip, beating Florida Gulf Coast, Kennesaw State, and Central Connecticut in Nashville Tenn. The top-ranked Bulldogs proved themselves in Nashville last weekend, winning all three games against some of the division’s top programs. In a set of games that has come to be known as “Judgement Week” due to the rendezvous of top caliber teams, UMD showed the depth of their talent and did so while trading the Minnesota cold for some southern sunshine. The wins solidified the Dogs as the top ranked team in the MCLA Under Armour Coaches Poll and leaves a positive outlook for the remainder of the season. In the first game of the trip, the Bulldogs faced the Florida Gulf Coast Eagles from Fort Myers. The game was moved indoors to the Vanderbilt Rec and Wellness Center due to severe thunderstorms. 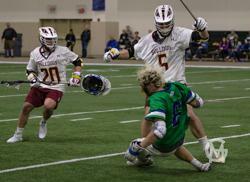 FGCU head coach Mike Dubbelde, a UMD Lacrosse alum, had his Eagles ready for revenge after being decisively beaten by UMD in Nashville last season. FGCU had UMD on its heels for the majority of the game, holding a one-goal lead until the fourth quarter. Both teams played physical, trading noteworthy hits throughout the game. It was in the final 15 minutes that the Bulldogs’ offense went to work, putting away four goals for a final score of 12-9. Freshman goalie Ben Serstock got his first start of the season and made consequential saves on the doorstep throughout the game. The following morning the Bulldogs woke up early to play the Kennesaw (Ga.) State Owls at 10 a.m. back at Vanderbilt. These two teams have lots of recent history after the Bulldogs beat them decisively on two occasions last season. The first being a 17-9 win in Nashville, the other being a 16-4 pounding in the second round of the MCLA National Tournament in Salt Lake City. The Owls came into the game with plenty of energy having been unbeaten and coming off a late night win over St. Thomas the night before. This was UMD’s first game outdoors since nationals last season and they were feeling hot. The defense was unbeatable in the first quarter, shutting down every possession. The Owls came back later in the game and tied it early in the third quarter. Jake Pitts had his best performance of the season so far putting away three goals late in the game to solidify a 12-9 UMD win. Later that same day UMD hit the field again after enjoying the Tennessee sun for a little while. This time it was to play the Central Connecticut State Blue Devils. Central Connecticut came into the game ranked 15th and coming off some tough losses against Dayton and Grand Valley State. The Bulldogs got going early resulting in a halftime score of 10-1. This combined with the fatigue that comes with playing a doubleheader in the sun, meant UMD utilized all their players for the remainder of the game. The second half saw freshman Andrew Carlson score three goals in his first MCLA game. The final score was 15-6. The Bulldogs wrapped up their day with some hearty southern barbeque in downtown Nashville, and a walk around all the honky tonks on Broadway. The following morning the team went on a tour of Bridgestone Arena, home of the Nashville Predators, thanks to Predators owner and Duluth native Herb Fritch. Later that day the team visited the Tennessee State Capitol and got to meet the Tennessee Lt. Governor Randy McNally, a fellow lacrosse player, thanks to UMD Alumni Paul Fassbender. The team was still en route home from Nashville when they learned that UMD had garnered all 21 first place votes in this week’s national poll, making the Bulldogs the top-ranked team in the country unanimously for the first time this season. UMD is now looking forward to their contest against the 11th-ranked Montana State Bobcats at the East Carver County Athletic Center in Chaska, Minn. The game is on Sunday, March 17, at 1 p.m.